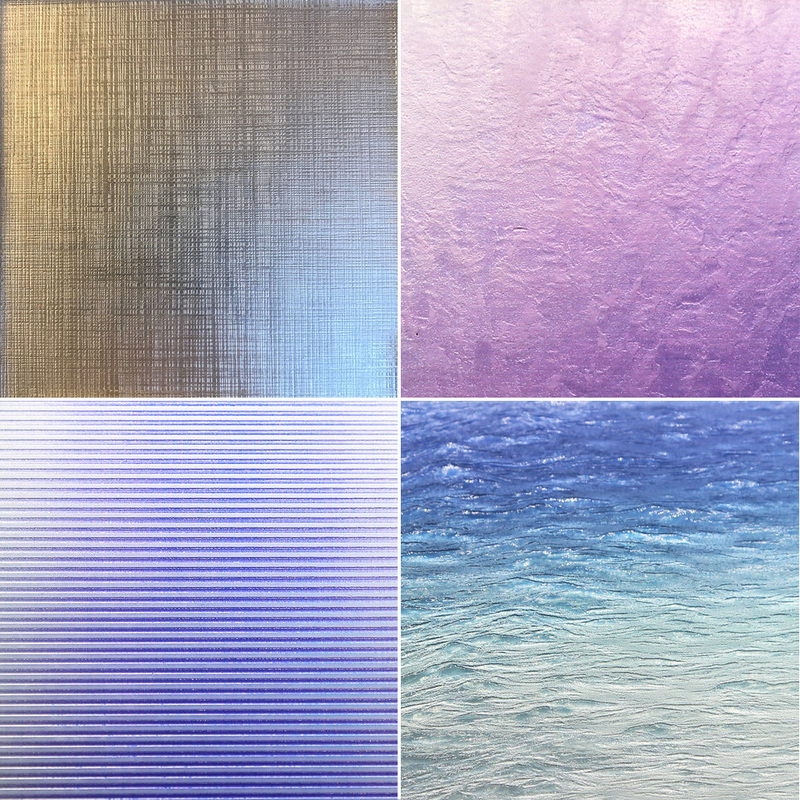 A stunning new range of glass surfaces with unlimited permutations that are unique to the Axolotl portfolio. The Spectrum process refers to Axolotl’s unique ability to custom colour the surface of a material. Previously only available as Spectrum sheet metal, we have now extended our technology to work over glass surfaces as well! Lustre Spectrum is typically available as 6mm thick annealed glass. As the backing is solid is generally adhered to surfaces and used as a wall, signage or counter front treatment. Spectrum Glass has the same bespoke surface effects, however it is applied onto a translucent glass surface allowing you to see the colour and pattern from both sides of the glass. Spectrum Glass is available in any glass float, thickness or treatment making it the versatile choice for joinery doors and internal screening. Spectrum glass panels can be created in sizes are up to 2400 x 1600mm, and are suitable for internal applications only. As always with Axolotl, there is unlimited potential for design, colour, and graphic effects allowing you to create something truly unique for your next project. Link. Published on March 11, 2019 by Jackson Wicks. We have made some updates to our website to help make designing with and specifying our products easier than ever. You can now view our range of applied metals in a comprehensive range of textures, ageing and surface effects. We also feature designs that have been created through carving, routing and 3D printing processes. When you click on the tile a larger view will appear with all the specification details, it’s as simple as dragging and dropping the image into your schedule! And to help for custom pieces we have also included a specification guide for all our surfaces on our new Technical page. Of course, the website can't feature every way our surfaces can be used and as always get in touch if you would like to work together to create your own unique surface design. For those who haven’t visited our website for a while, the site has been updated with a Media page which includes Q + A’s with a number of magazines providing insights into our business and design thinking. We have also added the Our Team page featuring the designers and other key people behind the scenes so that you can get to know us better! Of course, we wouldn’t miss the chance to also update the photos in our Gallery with the latest and best of Axolotl. We hope you enjoy having a browse. Link. Published on February 21, 2019 by Jackson Wicks. As the year draws to a close we would like to take the opportunity to thank our clients, staff and friends for your continued support and wish you all the best for the festive season and the New Year! 2018 has been a positive and busy year at Axolotl with two new products launched, Cement Paint and our new Terrazzo surface - a world first at only 0.5mm thick. 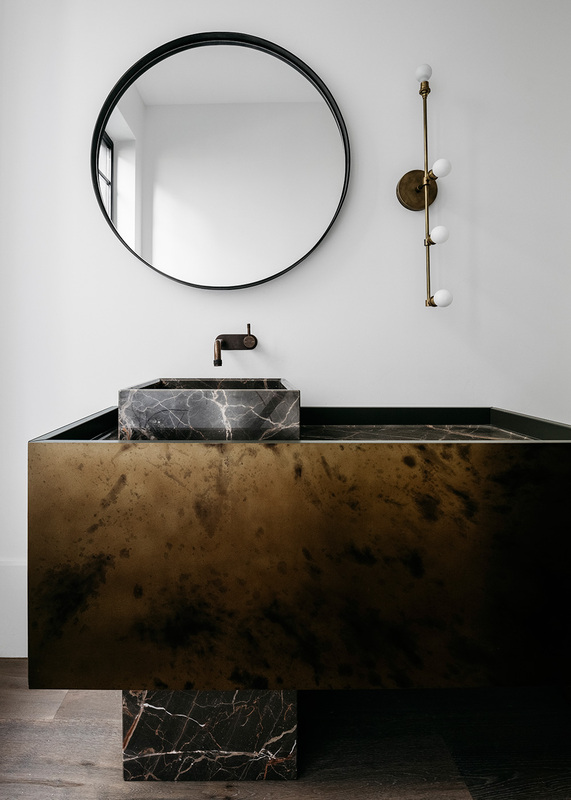 - The award winning The Collectionist Hotel where leading artists and designers including The World is Round, Amber Road and Willis Sheargold created a riot of colour and eclectic design across 39 unique rooms with the use of the Axolotl Paints Metta, Chroma and Micaceous ranges. 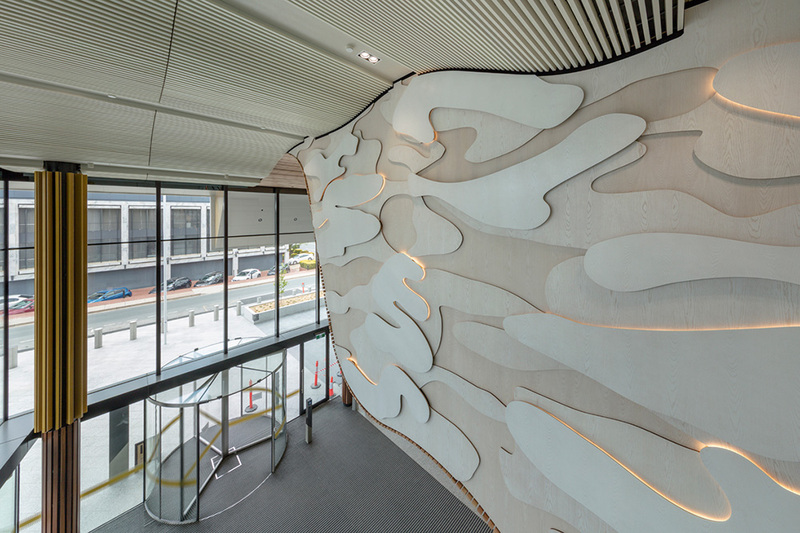 - The Pacific Club Bondi by Dreamtime Australia Axolotl Timber Wash & Chroma throughout the whitewashed interior. - The Glasshouse by Nina Maya, with bronze entry door, rear garage door, vanities and Axolotl Paints throughout. - Works on prestigious hotels including the Shangri-la Cairns, W Hotel Brisbane and Pan Pacific Melbourne. - Material support to Amber Road for their exhibit in the 2018 Rigg Design Prize. - Beautiful artworks for The ACT Law Courts, the Coroners Court, Harbord Diggers and Waverley Mall with artist Jade Oakley. - The Banksia fire-pit artwork for Barangaroo’s Naidoc week celebration with artist Bibi Barba. - Marcus Piper ‘Fracture’ artworks for the New York Affordable Art Show. Axolotl also sponsored a number of events this year including the IDEA awards for the ninth year, the Good Design awards, Habitus House of The Year, and GZ Design Week in Hong Kong. We were a Supporting Partner of Sculpture by the Sea, Bondi for a second year sponsoring four exhibiting artists, we sponsored Matthew Sheargold’s exhibition ‘Hyperkulturemia’ where Axolotl Paint was used in every artwork, the UTS DAB graduation showcase, and UTS fashion honours student Agnes Choi’s ‘Triumph in the Skies’ piece from her honours collection which was also the winner of the Swarovski crystal sponsorship. To top it all off this year Axolotl was also awarded the Leading Architectural Product Supplier by Apac Insider, the most Innovative Multi-disciplinary Australian Design Firm from Lux Life and both Spectrum and Axolotl Paints were a finalist in the ADEX awards. We are already working on new projects and products that will be debuted in 2019 as we continue our commitment to being ‘The Future of Surface’. Axolotl will be closed from Friday 21st December and will reopen Monday 7th January. Link. Published on December 13, 2018 by Jackson Wicks. Link. Published on December 06, 2018 by Jackson Wicks. Link. Published on December 04, 2018 by Jackson Wicks. Guardian is the balancing act of found and shaped metal objects formed to establish a nominal totemic orientation. Link. Published on October 23, 2018 by Jackson Wicks. The prestigious Rigg Design Prize launched on Thursday at the National Gallery of Victoria to rave review. 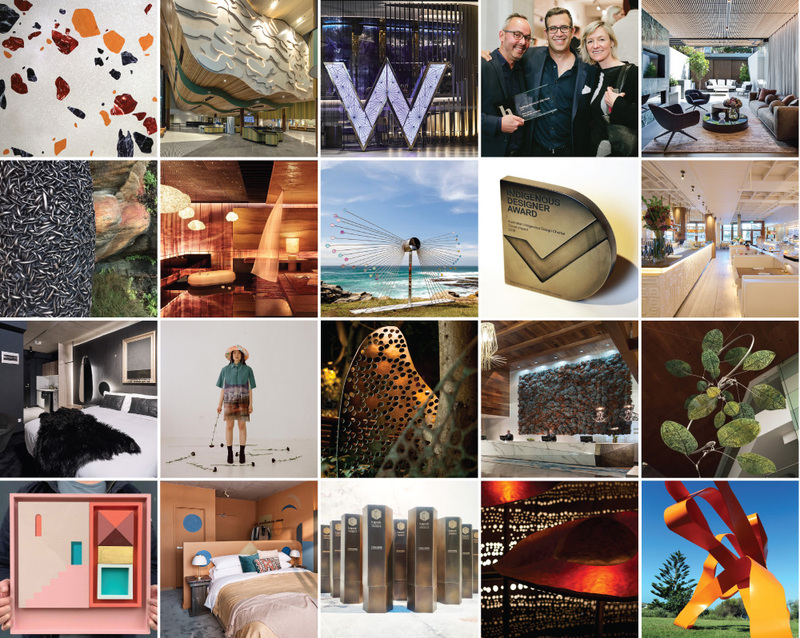 The triennial event celebrates Australian design and architecture, this year focusing on the field of Interior design and decoration. Ten renowned interior design studios were invited to design and create a purpose built interior responding to the theme of ‘Domestic living’. 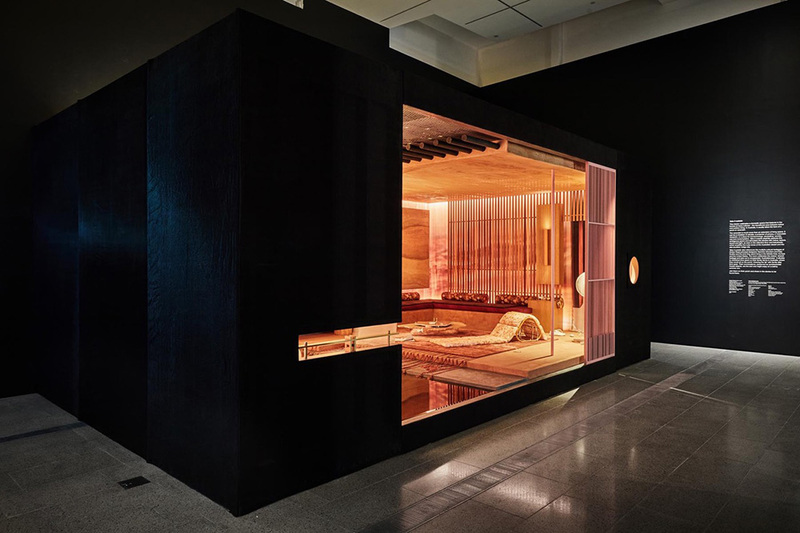 Each exhibit highlights the important role interior design plays in shaping our lived environments, manipulating the senses, telling stories, and communicating our values and attitudes. Axolotl are proud to support our friends at Amber Road in their entry to the 2018 Rigg Design Prize. 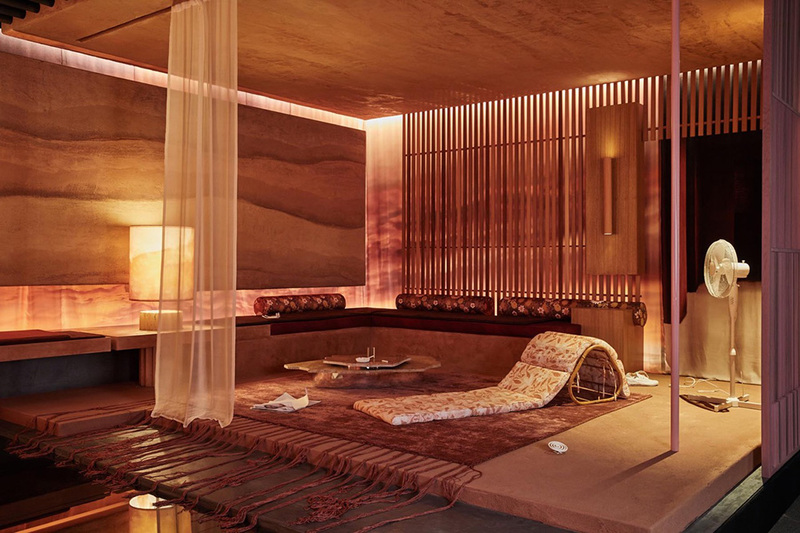 We are forever in awe of the team’s creative take on interiors, and fearlessness of colour and texture. Amber Roads exhibit Take it Outside is the perfect example of this, and explores the transitional space between the indoors and outdoors. Axolotl sponsored Take it Outisde, providing the mirror glass walls and floors which reflect the brilliant star studded sky, and white washing iconic Aussie objects such as the mozzie coil, terry towelling, thongs and even a can of VB to capture the Australian outdoor experience. This years Rigg Design Prize featured a stellar line up of design studios including Arent & Pyke, Danielle Brustman, David Hicks, Flack Studio, Martyn Thompson, Scott Weston, Sibella Court, SJB and Hecker Guthrie who took top honours and won this years Rigg Design Prize with their exhibit The table is the base - honouring the humble table. Be sure to check them all out, entry is free and The Rigg Design Prize is open until 24 February 2019 at Ian Potter Centre: NGV Australia at Federation Square. Link. Published on October 18, 2018 by Jackson Wicks. Axolotl introduced 3D printing in 2017, continuing its tradition as leaders in design innovation. Since then, it has partnered with architects and interior designers to create architectural artworks as well as originating exciting new products like Axolotl Terrazzo and Spectrum. We were excited to be featured recently in an article on new online magazine HouseLab, about Axolotl's capabilities in 3D printing. Read it for yourself below. The possibilities of 3D printing on any material are endless. A detail of a Nickel printed pattern by Axolotl. 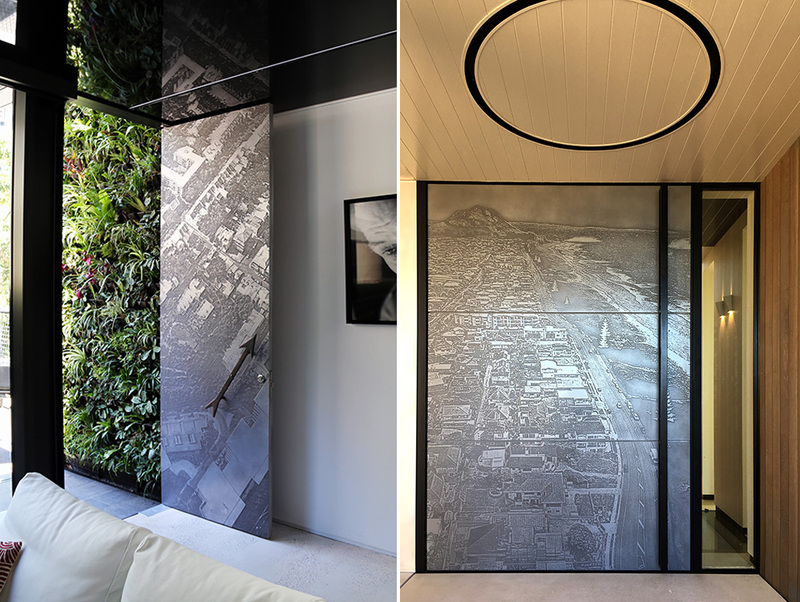 When media became digitised the world screamed “print is dead” but, in fact, combining digital technology with age-old printing techniques has created an entirely new dimension to architectural surfaces that can be personalised across almost any application. Our connection with printed matter is more than coffee table books and the Sunday paper, it's like buying the LP when you can download the album on Spotify. It is tangible, textured and large format. The 3D printed entry to Nina Maya Interiors' The Glasshouse Photographed by Nicole England. 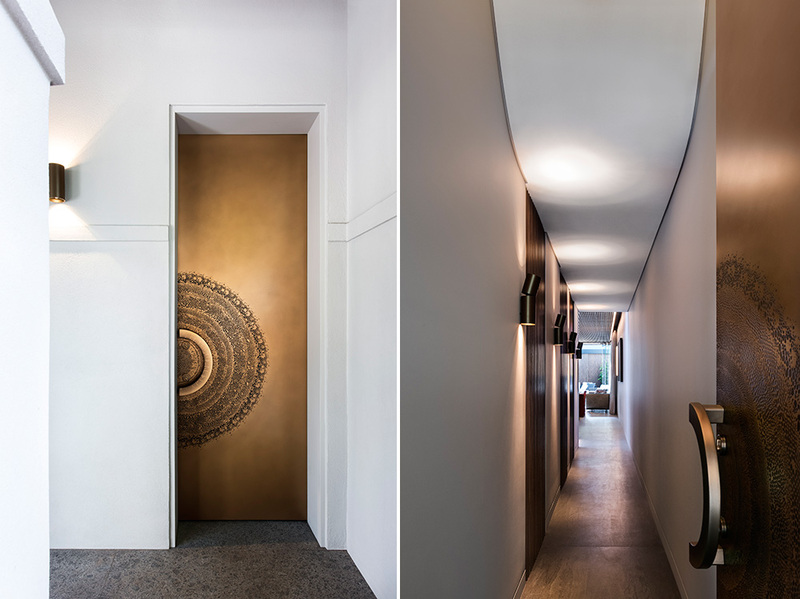 Take the bronze entryway to Nina Maya Interiors’ recent project, The Glasshouse, in the Sydney suburb of Paddington – and yes, you’d be forgiven for thinking it took an artisan hours, painstakingly etching the pattern. In fact it is 3D printed and like a true artist’s work it is completely a one-off – the skill of the modern digital artisan remains equally important as the traditional artist. That is the great thing about this new technology, combining the feel of the old with the potential of the new, and really the possibilities are endless when you combine an idea with those who know how to make it become reality. Making our way to the rear of The Glasshouse, this comes to light with a three-panel bronze cortex gate acting as a functional feature wall. 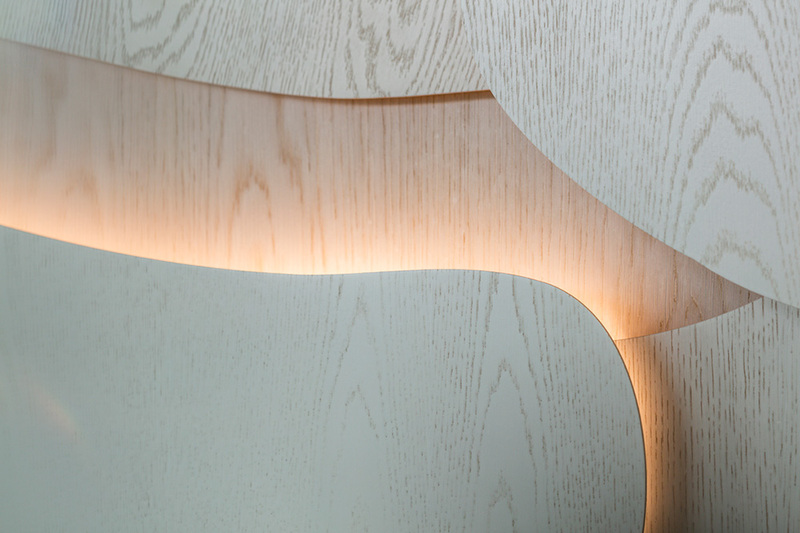 Another example of how we can approach surfaces differently, and the texture is as engaging as the finish. These new approaches to printing and surface treatments bookend the home and also showcase the possibilities we have to hand. The application of this technology isn’t just limited to doors, nor is it limited to metal. Today we can print on virtually any substrate from terracotta to glass, including concrete and timber, with an added dimension of up to 150mm meaning it really does come down to your imagination. 3D printed doors are just the beginning of what this new technology can offer. Left: Grand Designs by Chris Knierem - Design Construct (Photograph by Belinda Knierem) Right: Smith Residence in New Zealand by Di Smith (Photograph by Di Smith). By engaging a graphic designer or artist in the process, any pattern can be achieved to create a statement piece in the home that is truly yours. HouseLab co-founder Marcus Piper recently pushed the boundaries of this thinking with his Differences series exhibited at the Australian Design Centre. Printing on aluminium plate, the graphically-geometric series showed how 2 and 3-dimensional printing can hang together as one – playing with light to create depth in what would otherwise be a flat plane. 'It’s like printing an enormous magazine cover and they look different from every angle!' says Piper, who has been designing magazines for the last 20 years and is now endlessly excited about the potential of being able to produce artworks up to 1600x2400mm. Difference 03 and Difference 01 by Marcus Piper, printed and 3D printed on aluminium at the Axolotl showroom. And really size is the only limitation here – be it a garage door, a contemporary take on a pressed-tin ceiling or a poolside glass facade it comes down to the mark you want to make, as combining these multiple printed panels opens up a world of opportunity. So, what lies ahead in surface technology? The sky is the limit but it ultimately comes down to finding the right team who understand the potential and can make the most of it in a way that suits a home. One thing is for sure, print is well and truly alive and it is definitely going places. 1. Engaging a graphic designer or artist who understands the process can achieve incredible results. 2. 3D and surface printing can be applied to almost any substrate across applications from doors to bed-heads. 3. 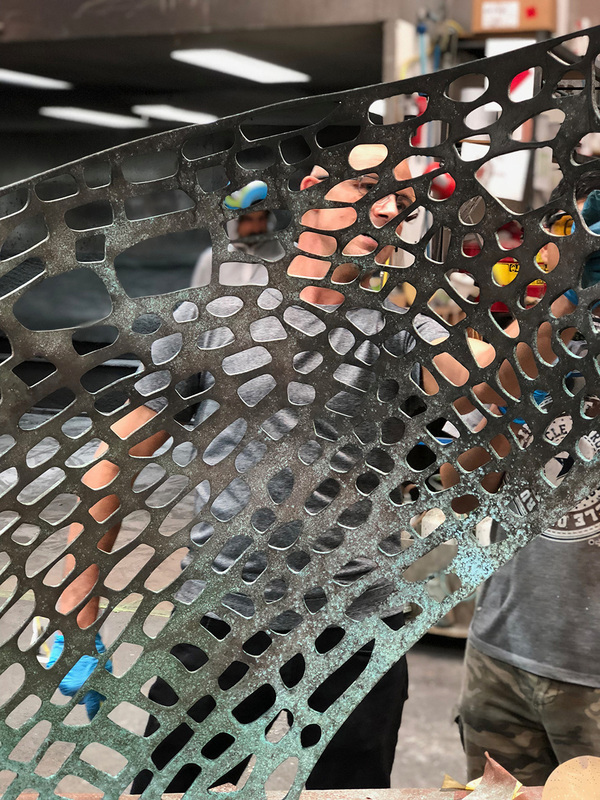 Being able to apply metal, concrete or stone finishes with 3D printing can make for a cheaper, lighter-weight outcome, perfect for joinery or feature walls. 4. 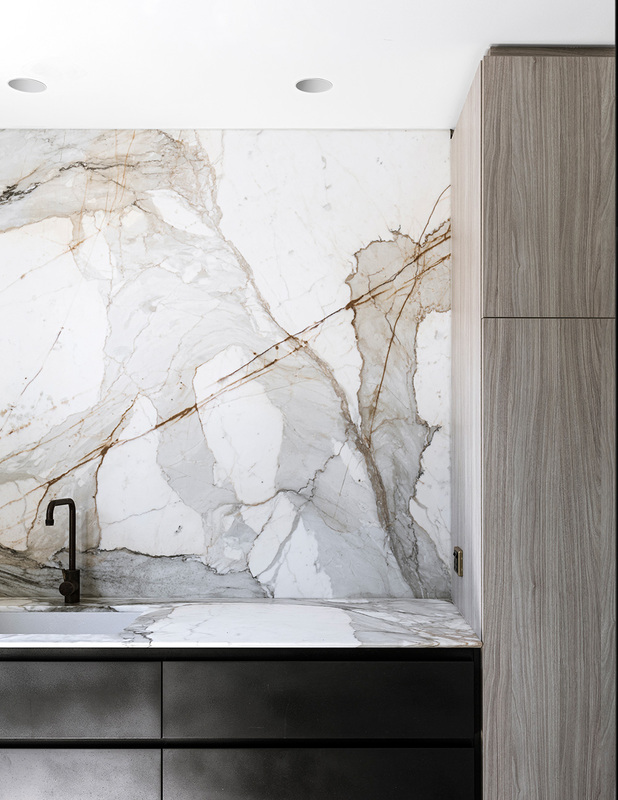 The options and combinations that can be utilised with this new technology is seemingly endless, something your architect or interior designer will be able to advise on. To find out more about custom printing of architectural surfaces contact Axolotl. Link. Published on October 16, 2018 by Jackson Wicks. Last month Bondi scored its newest hospitality gem with the opening of all-day eatery The Pacific Club Bondi Beach. 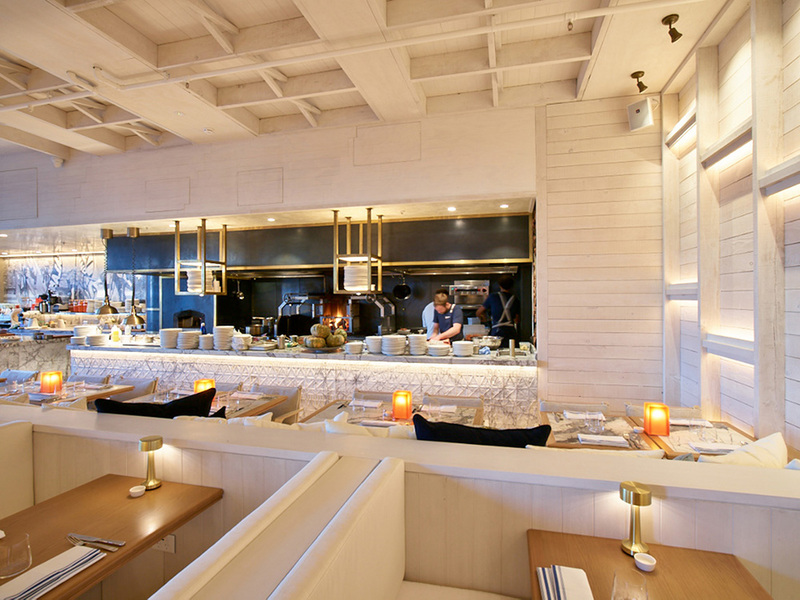 Making its home within Campbell Parade's Pacific Building, the chic bistro and beach club boasts an enviable team of well-known hospitality luminaries to help bring it to life. Harvest Newrybar's Bret Cameron is heading up the kitchen, an expansive wine programme comes courtesy of award-winning sommelier Chris Morrison, and 2016 Australian Bartender of the Year Michael Chiem is lending his talents to the cocktail list. 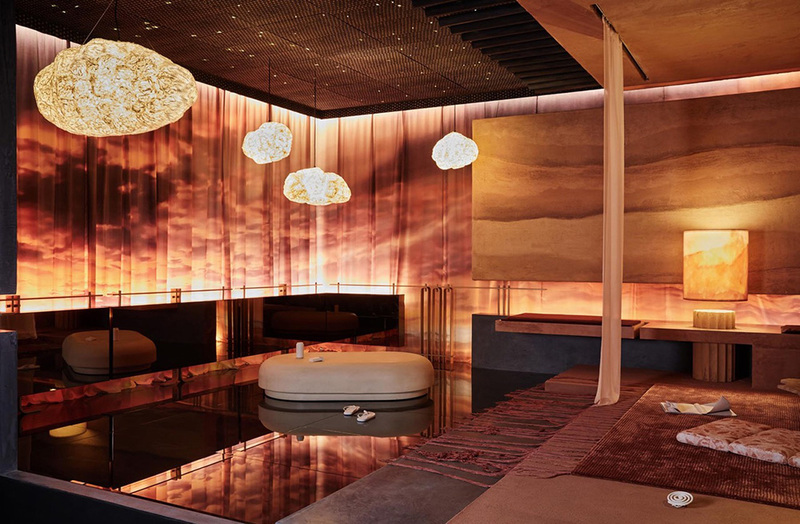 The space itself is the work of internationally renowned hospitality designer Michael McCann, from Dreamtime Australia Design. “Our lifestyles call for dining that is an extension of the way we live. 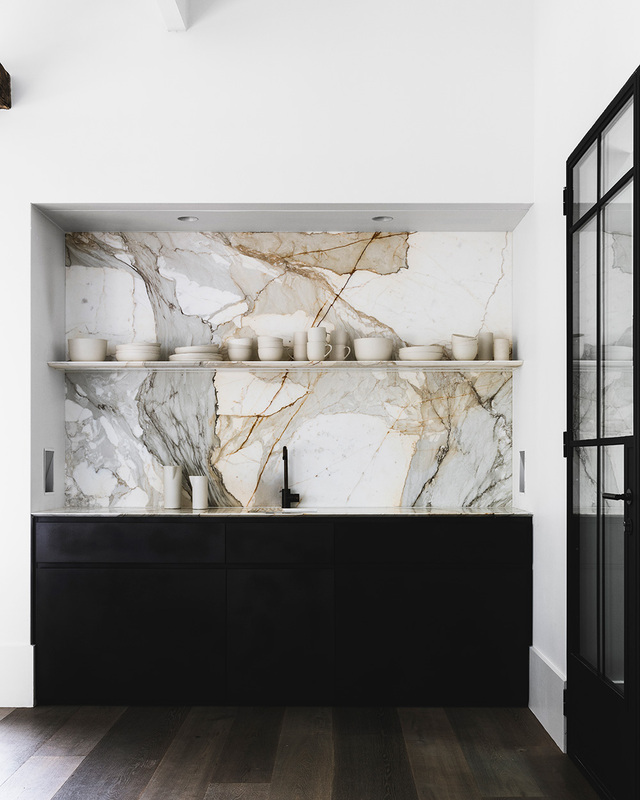 With the open planned kitchen as its centrepiece, the ‘home away from home’ environment has drawn on whitewashed palettes, warm wooden textures, and finished with the polish of marble,” says McCann of his vision. 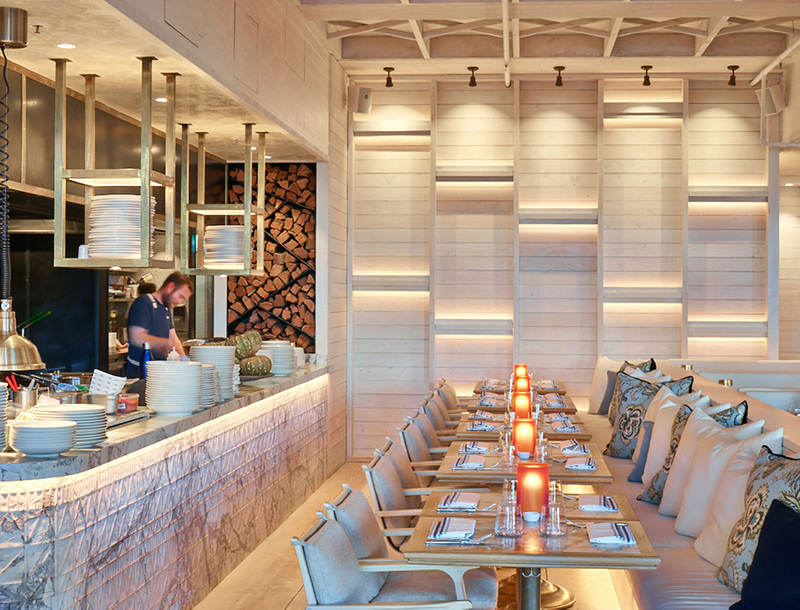 The whitewashed palettes throughout the restaurant were provided courtesy of the Axolotl Paint range, with TimberWash Interior in Roan used on the walls and ceilings. The colour imbues a clean minimalist aesthetic that makes the very most of its beachside locale. With its idyllic waterfront location we think The Pacific Club is definitely worth a visit. For more information on our TimberWashes and on Axolotl Paint please visit our website or contact us on 02 9666 1207 or at info@axolotl.com.au. Link. Published on October 02, 2018 by Jackson Wicks. Link. Published on August 17, 2018 by Jackson Wicks. Terrazzo is one of 2018's biggest interior design trends, so it is timely for Axolotl to launch its newest surface, Axolotl Terrazzo. Versatility is the key to its success — Axolotl Terrazzo can be customised with fine or oversized aggregate in monochromatic, pastel or bold colour tones, and is available in a range of concrete colours to complement a variety of residential and commercial styles. Axolotl Terrazzo is not a laminate, but rather an applied finish whereby the fine coloured aggregate is bound in the Axolotl Concrete treatment. It can be applied to almost any substrate including MDF and mild steel. Axolotl Terrazzo is suitable for internal applications, and each panel is treated to order. Applications can include counter fronts, feature walls, lift interiors, cabinetry, splash backs and signage. The unique properties of our terrazzo provide a flexible surface effect that encompasses the beauty of terrazzo without the common weight, colour and size restrictions of the traditional material. For more information on Axolotl Terrazzo visit our website or showroom, or call the office today. Link. Published on August 13, 2018 by Jackson Wicks. Link. Published on July 26, 2018 by Jackson Wicks. Link. Published on July 23, 2018 by Jackson Wicks. 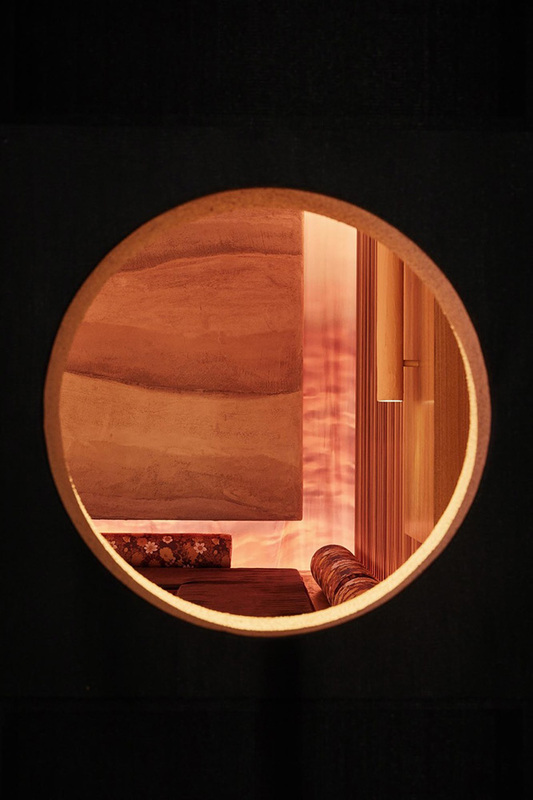 Sydney's newest and most creatively unique, hotel – The Collectionist – has officially opened, ready to change the way guests choose to stay and experience hotels. 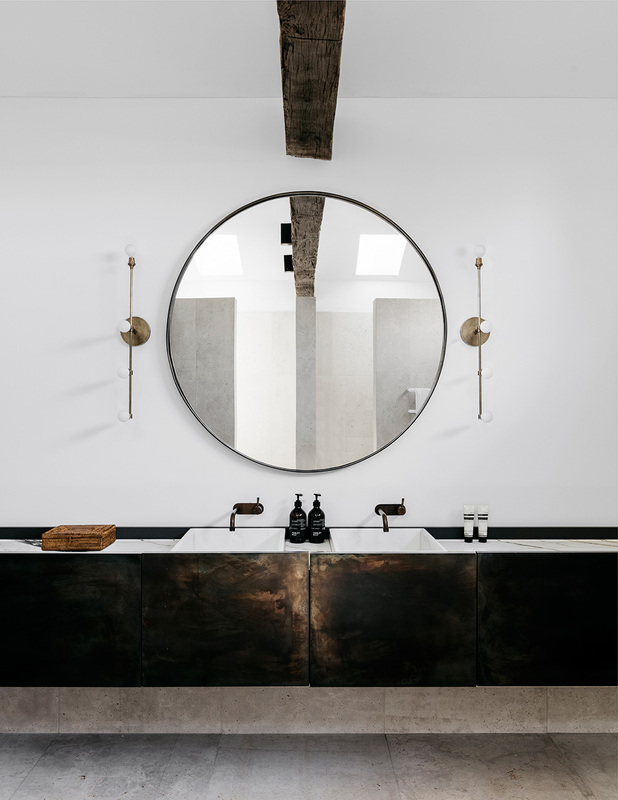 The Camperdown situated hotel, is the first for The Collectionist Hotel brand with plans to take the unique concept to other Sydney locations and interstate. 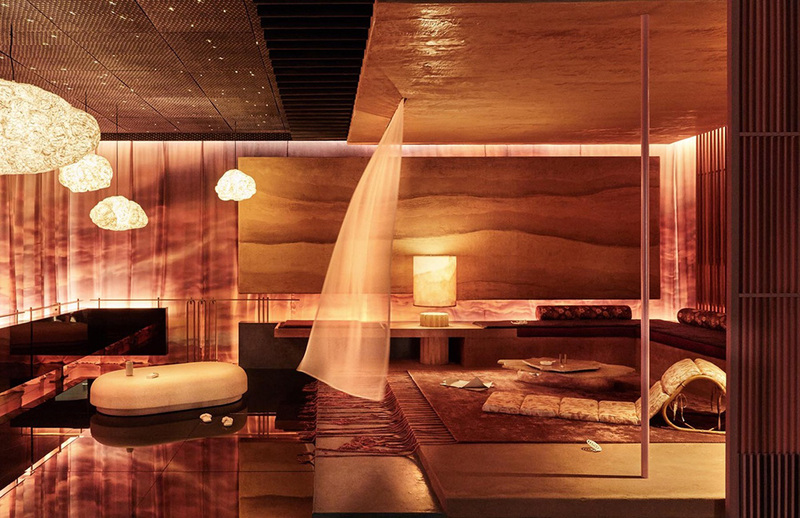 Described as a real-life “choose-your-own-adventure”, the eclectically designed hotel will set a new standard in individualised guest experiences. Opting away from standardised décor in rooms, The Collectionist commissioned the talents of 13 artists and seven designers from four leading design studios, to create 39 individually designed rooms. Instead of rooms being allocated by the hotel, guests are invited to peruse available rooms on check-in and choose their room based on the style, colour, texture and design - just as they would a work of art. Any design team that took on a brief involving 40 individually designed rooms could be called both adventurous and bold. Enter Andrew Cliffe, founder of “The World is Round”. Having been invited to bid on the project Cliffe set about assembling a team of designers who could bring the vision to life. “The brief was for every room to be different - a massive task for one designer. To win the project I needed to think differently,” says Cliffe. “Originally, I was imagining ten designers doing four rooms each, but reality set in and this switched to four designers doing ten rooms each.” The design teams credited with bringing The Collectionist concept to life include The World is Round, Amber Road, Willis Sheargold and Pattern Studio. Yasmine Ghoniem from Amber Road says about the Collectionist, "Our objective here was for each room to evoke a particular memory: a holiday, a dream, a person, an idea, an experience - ultimately something that would elicit a strong emotive response from the guest. 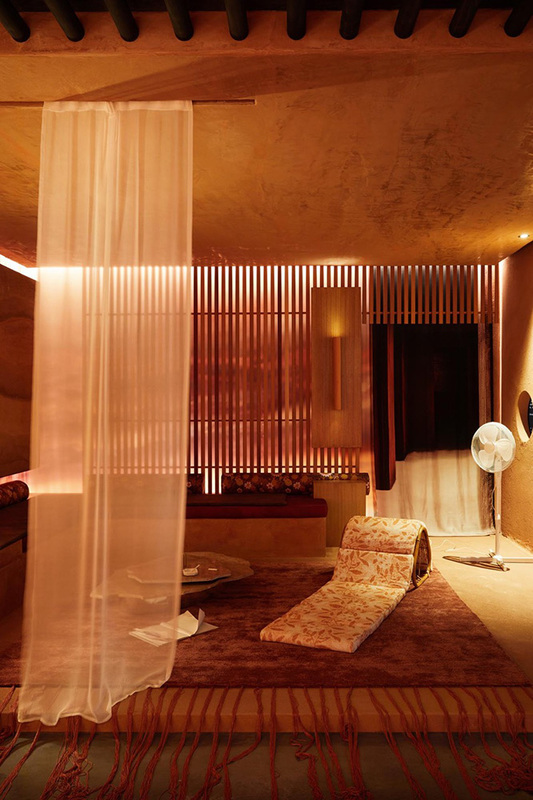 To create our desired response we employed a riot of colour, texture and artful detailing and in doing so, transformed each room into a feast for the senses”. The riot of colour was injected into the hotel with the use of the Axolotl Paint range. Metta, Chroma and Micaceous paints in varying sheen levels adorn the walls, ceilings and trims throughout the eclectic hotel. In some cases our paints were also used in the graphic artworks and on the furnishings. Axolotl Paint was chosen due to the superior paintability, quality and depth of tone achieved, as well as the beautiful matt finishes available in both the Metta and Chroma range. To see more images of the uniquely designed rooms at The Collectionist hotel click here. Link. Published on May 31, 2018 by Jackson Wicks. Link. Published on May 02, 2018 by Jackson Wicks. See more photos of the project, including production and process shots by visiting the project page on ourart website. Link. Published on January 30, 2018 by Jackson Wicks. Axolotl Florida launched in the middle of 2017 and the team dove straight into some exciting projects to flex their creativity and know how in the US design scene. The first project showcased is a private residence where our Zinc surfaces were utilised as a continuous theme throughout, with Zinc Lunar Pearl treatments to the feature walls and bar, and Zinc Smooth applied to the staircase to stunning effect. Finished to the highest standard, this project has a modern and sophisticated design sensibility which expertly shows how to introduce features that harmonise with the overall design of the home. In a separate project, Axolotl Bronze Florentine in our Skyline design was applied to the bar front at the new Florida bar, Casa D’Angelo. The end result is sophisticated and elegant, and complements the lavish bar décor. Wherever you are, and whatever you wish to achieve in your design get in touch with us for your next project. Link. Published on January 24, 2018 by Jackson Wicks. As the year starts winding down we would like to take the opportunity to thank our clients, staff, and friends for your continued support and wish you all the best for Christmas and the New Year! 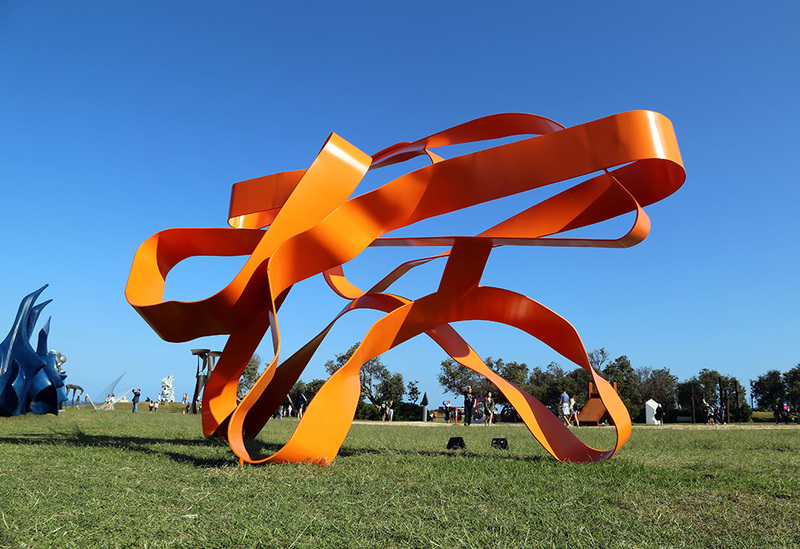 2017 has been a positive and busy year at Axolotl; we were a Supporting Partner of Sculpture by the Sea at Bondi, Event Partner at Design Made and had our products showcased at Denfair, Sydney Indesign and Design Made. 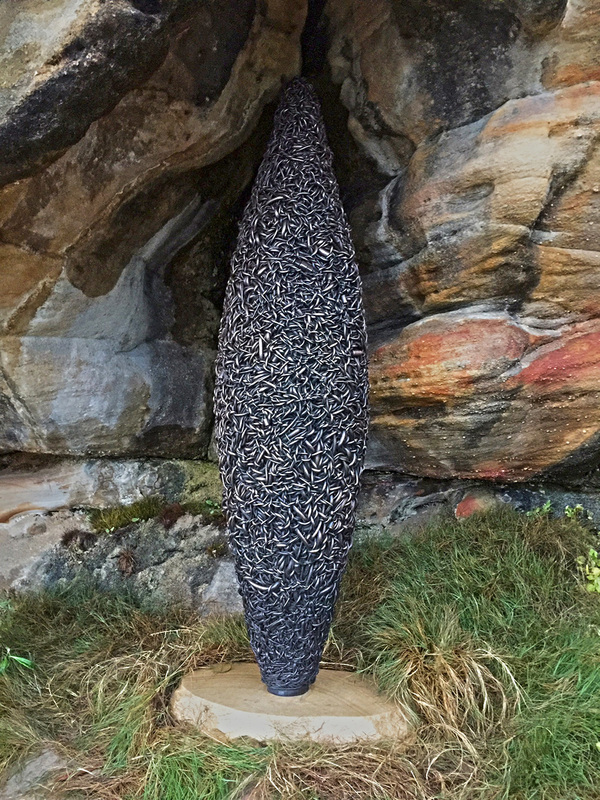 We sponsored the UTS graduating students, the IDEA awards for the seventh year, four artists at Sculpture by the Sea Bondi, Nina Maya’s Glasshouse and the Marcus Piper and Shannon McGrath exhibition, Fracture: Differences. Three new products were launched, Sculpt and LINK stone surfaces and our new coloured stainless steel Spectrum, extending our palette in beautiful new ways. We also love our new look showroom. Our Mojo bath ware received two awards from Good Design and the Sydney Design Awards and we were excited to receive two additional awards for Excellence in Environmental Architecture - Australia from the Excellence in Asia Pacific Awards and named the Best Global Architectural Products Supplier from the Australian Enterprise Awards. And to top it off we not only launched a new licensee in Florida, USA which is already creating some beautiful and groundbreaking work but have opened a new showroom and factory in New Territories and North Point in Hong Kong. We can’t wait to see what exciting projects 2018 will bring! As always, we remain committed to continue being ‘The Future of Surface’. Axolotl will be closed from Friday 22nd December and will reopen Monday 8th January. Link. Published on December 12, 2017 by Jackson Wicks. Axolotl are excited to announce the expansion of our China based operation with the opening of a new factory and showroom in the New Territories and North Point in Hong Kong. This sits alongside the much larger facilities in Jiangmen in China. Between the two locations, Axolotl China has the ability to create work to any scale. 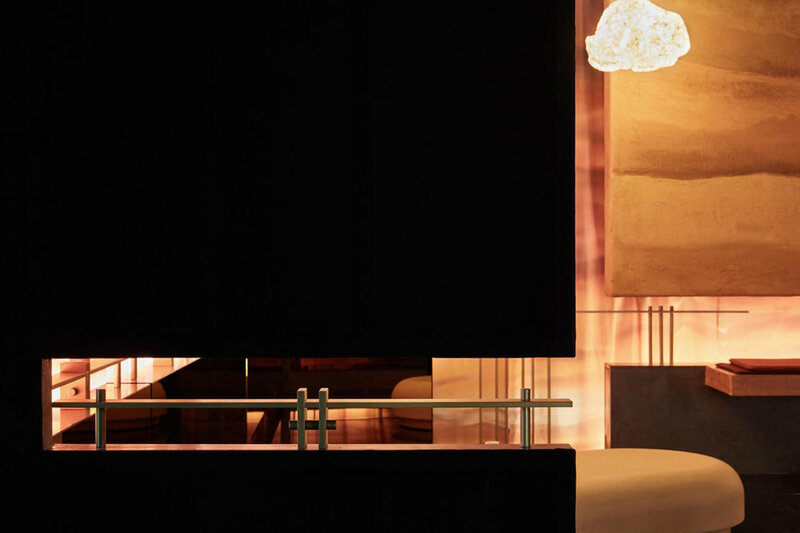 Headed by Eric Chan, the new showroom showcases an expansive range of art and architecture, including sculptures, panels, doors and a vast array of samples. Eric says, “There’s a genuine excitement about bringing Axolotl surfaces into Hong Kong and China. There’s a definite hunger for luxury in much of the market, and tastes in interior design are growing ever more sophisticated. We are fortunate that Axolotl’s technology is on the cutting edge of this entire category”. Link. Published on December 11, 2017 by Jackson Wicks. In honour of the exhibition and our role as a Supporting Partner, Axolotl Art Projects have put together a small video featuring the amazing work of sponsored artists. Turn your sound up and enjoy. Link. Published on November 03, 2017 by Jackson Wicks.